If you want to make sure that your content is at the front of everyone’s minds, make sure it’s at the top of their news feeds. We all get it by now: Social media is marketing’s new bread and butter. 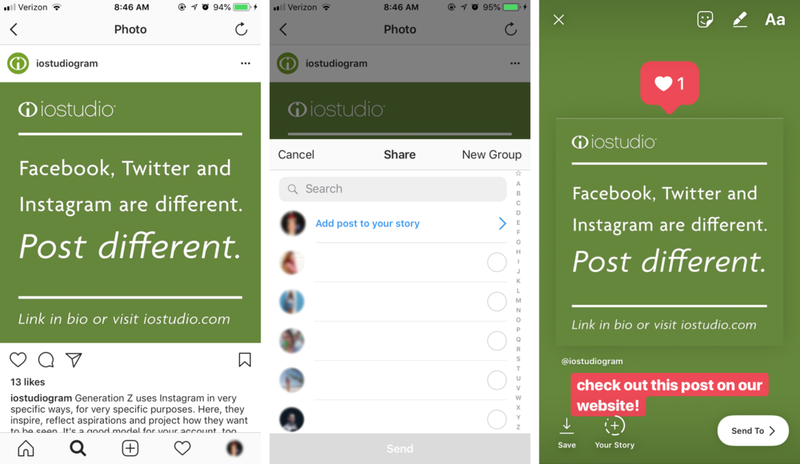 What better way is there to connect with your audience, gain insights and boost your visibility than by posting on, say, Instagram? From its humble beginnings in 2010, the platform is now home to more than 800 million users. Did someone say goldmine? The thing is, Instagram—like all social media—is continually evolving, and so are the folks that use it. As trends gain and lose currency, brands play catch-up—but we’re happy to help. So, while there will never be one everlasting approach to social media, here’s what you need to know to market your brand on Instagram today. Reshare content to your Story. Let’s say you make a post, but it doesn’t attract as much attention as you had hoped the first time around. Don’t worry! Instagram now gives its users a second chance, enabling them to share posts to their Story. By sharing a post, it’s added to your Story for 24 hours, allowing your followers to interact with the original post, respond via direct message or forward the Story—and post—to another user. So, make sure your content is at the front of everyone’s minds by putting it at the top of their news feeds. You can even share related content from other users, like customer reviews or testimonials. Stories are a great way to tell your audience about what’s going on right now—and an even better way of directing attention back to what you’ve already done. Instagram’s visual nature allows brands to show off their products, but what good is a product post if all your followers can do is window shop? You want users to purchase the goods and services you flaunt on your page, so tagging products is a must. By connecting accounts to Facebook pages with Shop sections, you can now tag a product in a photo, just like you would another user. This way, someone viewing your posts at home can spot an item they like, tap on it and be directed to the purchase page. No more “see link in bio.” No more reverse image searching. That means more active shoppers. Plenty more. Being competitive means being in the know—and making sure that your audience is too. Previously, our scope of intel was limited to the people we follow, making it difficult to see outside the “bubble.” Now, users can opt to follow entire hashtags and have all content related to that tag delivered directly to their Home news feed and Stories sections. Just search for a hashtag and follow away. For brands, this feature grants the power to be constantly aware of everything that’s happening in a specific industry or sphere. For consumers, it exposes them to new, relevant accounts and brands that they might not have discovered otherwise. Plus, everyone can easily track what tags are currently trending worldwide. G.I. Joe might think knowing is half the battle, but this win-win can get you much further than halfway. Instagram is starting to catch up to Facebook in terms of social media analytics. Though somewhat limited, Instagram’s View Insights platform is available to business accounts as a way to track a post’s reach, impressions, profile visits and more. All you have to do is go to a post and tap View Insights to access the information. These insights are critical to determine how far each of your posts are really going. You’ll be able to tell how many individual accounts your post reached and what percent of those accounts are users outside your follower count. Use this feature to figure out what kind of content does the most work for your brand, and take the guesswork out of your strategy. And one surprise tip: Blend in. This tip might surprise you: Try not to announce yourself too much. You may be thinking, “Isn’t the point of marketing to announce yourself?” Of course, but remember that social media was originally built for people, not brands. Most users today don’t want to interact with brands—and will actively try to avoid it. So, sure, stand out and make your mark, but try to do so while blending in with the personal accounts your audience follows. Instead of a flashy graphic with lots of text and slogans, try posting photos of relevant locations or people using your products. It’s less off-putting to users and can convince them that you’re just another friend that they follow, leading to higher levels of interaction and the achievement of the highly coveted Instagram aesthetic. Want to advance beyond social media tactics? Our creative team would love to get started on a comprehensive digital strategy for your brand. Just ask.